OK, this isn't as gross as some other pictures (seriously, don't click that link) that we've posted on the site recently, but we have still cropped it for the sake of the squeamish. 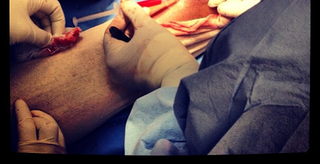 If you want to get a good look at Kobe Bryant's sliced-open heel, go ahead and click through. Kobe Bryant is a gigantic weirdo. That's all we really have to say about his decision to share this picture with us.